College degree graduates turned NASCAR driver heroes are few and far between, but there are a few characters who managed to spend time out of their racing careers to achieve their online MEBME degree by using an online MEBME program. Many top NASCAR racers didn’t have the time to concentrate on their college years because racing took over. However, the below NASCAR racers still managed to obtain a degree that they could fall back on if their NASCAR dreams didn’t become a reality. Jennifer Jo Cobb isn’t just a pretty face with a knack for beating men on the race track – she has also earned her degree in journalism. Jennifer took her love for NASCAR and journalism and mixed them together when she became a professional sports reporter while still racing. She wasn’t just a success in front of the camera either – she also earned a 6th place finish in the 2011 Camping World Truck Series, which makes her one of the most successful ladies on the track. Bill Lester is a former NASCAR driver who started out as an engineer & project manager for Hewlett-Packard. He’s well-known and respected as the first African-American to race in the NASCAR Craftsman Series as a full-time job. Before he began his career at Hewlett-Packard and became a full-time NASCAR professional, though, he managed to achieve his bachelor’s degree in both computer science and electrical engineering. He wasn’t a huge success on the track, but he knew full well that because he had his degrees and an interest in EECS (Electrical Engineering & Computer Science) – he would always have something to fall back on if his NASCAR career didn’t work out. Ryan Newman still plies his trade in the Monster Energy NASCAR Cup Series, working under his team, Richard Childress Racing. The 39-year-old, known to NASCAR fanatics around the world as “Rocket Man”, isn’t just a genius in the hot seat. Before he took up his love for racing, he studied engineering at university, where he managed to land himself a bachelor of science. So, Rocket Man isn’t just a hero behind the wheel thanks to his over 50 pole finishes; he’s also a hero when it comes to his teammates because of his love and knowledge of engineering. Although Brett Bodine is a former NASCAR Winston Cup Series driver, he still makes his presence felt in Cup Series events. Bodine wasn’t a huge success on the track like his brothers, Geoff and Todd, but he still managed to get to the pole on five occasions during his NASCAR career. Luckily for Brett, he had the skills in mechanical engineering where he earned his associates degree at Mitchell Community College in North Carolina. 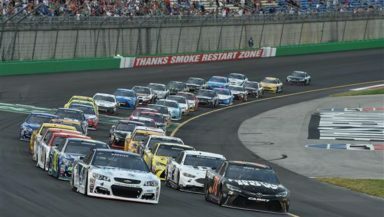 College is sometimes at the back of the mind for some of the current NASCAR drivers because their racing events take up too much practice and travel. However, the above NASCAR legends have all managed to leave college with something to fall back on, knowing the NASCAR industry is far from easy to make a living from. You forgot HOF member Alan Kulwicki. Glad he will be remembered now.